The tiara shares a great deal in common with the family's amethyst bandeau. Like that tiara, this one is also a part of a demi-parure, with coordinating earrings and a necklace. I think it’s highly possible that these two sets were made at the same time, during years when Grand Duke Jean and Grand Duchess Joséphine-Charlotte were the reigning couple in the country. She wore the tiara for a state visit to Italy in the early 1980s; she also wore the tiara at an event in Denmark near the end of her life. The current grand duchess, Maria Teresa, chose this tiara for one of her first formal portraits after becoming the hereditary grand duchess. Apart from an outing in the 1990s, when Princess Margaretha of Liechtenstein wore the tiara during a Luxembourg/Belgium state visit, the piece was not seen again until more recently. 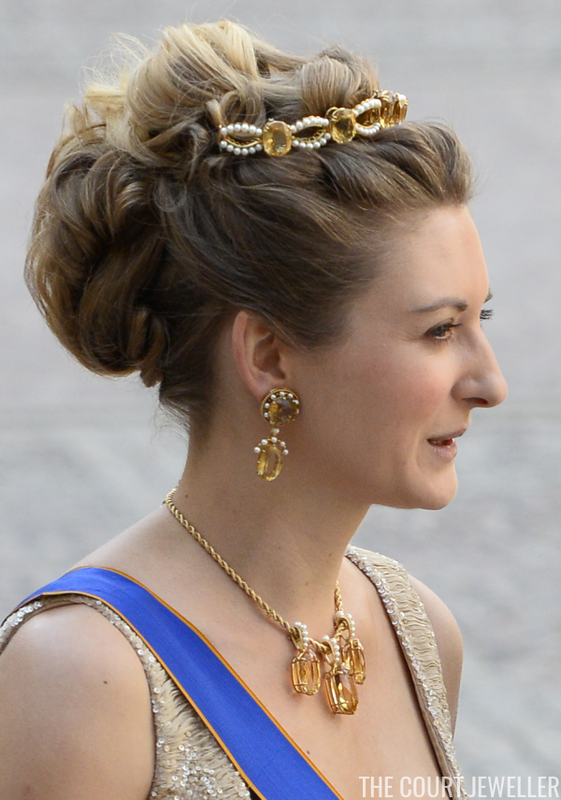 Princess Alexandra wore the tiara during the 2011 National Day gala, and her mother appeared in the set once again on a 2012 state visit to Germany. 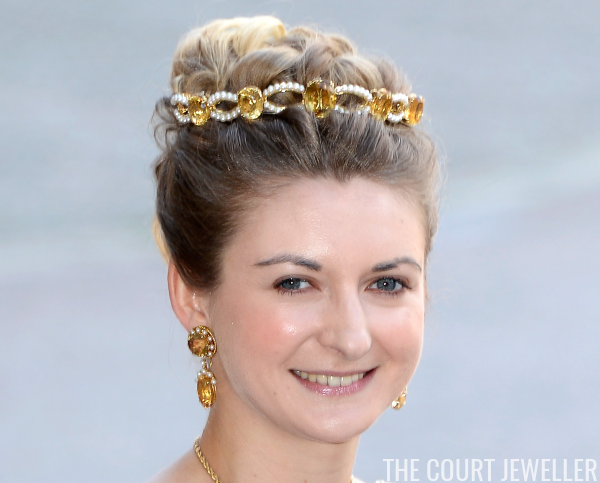 And continuing her tour through the tiara holdings of the grand duchy, Hereditary Grand Duchess Stéphanie has also donned this sparkler. She appeared in the tiara at the wedding of Princess Madeleine of Sweden, which took place in the summer of 2013. Cleverly, on that occasion, the yellow stones in the tiara and her blue order sash combined to form the colors of the Swedish flag — which, accidental or not, was pretty nifty!